UPDATE 7/2/2012 - Kodak Gallery is closing and will be transferring its business to Shutterfly. According to the site, your photos will move over to Shutterfly automatically, but projects (like photo books) will not. Kodak is probably a familiar name to those who remember the days of film. Kodak Gallery is the online photo service formerly known as Ofoto. Ofoto was started in 1999, becoming a wholly-owned subsidiary of Kodak in 2001. In 2005, it became known as Kodak Gallery. Update 4/25/2012: Kodak Gallery is set to be sold to Shutterfly. Stay tuned for details! In addition to photo books, you can make prints, calendars, photo cards and other custom photo gifts such as blankets, mugs, mousepads and jewelry. 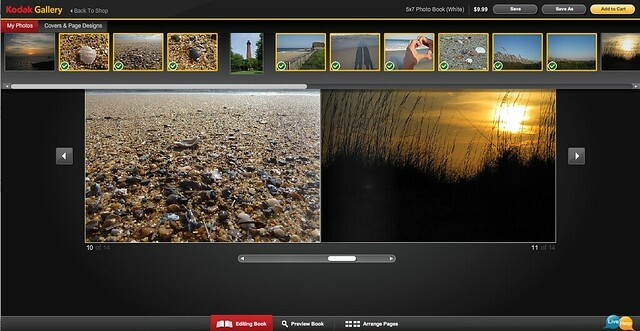 Kodak's photo book software works online and offers two main design options, a custom option to drag and drop photos into pre-made templates, or SMARTFIT technology which auto-arranges your photos in the order in which they were taken. It's a good option for anyone wanting to make a quick photo book with minimal effort. Kodak Gallery offers both hardcover and softcover photo books, all in landscape format. Books come in 5 sizes ranging from 5.75x5 through 14x12. If you need help, customer service is available via, e-mail, search and "Live Chat", the latter becoming a popular and useful way to instantly get answers while making your book. See the chart below for more stats on Kodak Gallery. Click here for information on the specific photo books offered as well as a links to the latest Kodak Gallery coupon codes and deals. Click HERE to go to Kodak Gallery's site! Don't forget to check the main Photobook Deals page for all of today's deals! Bookmark that page or fan me on Facebook and you won't miss out on the latest coupon codes! Save money with the latest Kodak Gallery coupons and deals, or see if there are any Kodak Gallery groupons. Thinking about designing a photobook on Kodak Gallery? You can view a detailed chart of every Kodak Gallery photo book, including sizes and pricing. See the full list of Kodak Gallery photo books.